Sometimes you need to delete and order from ReadytoShip, this article explains how. 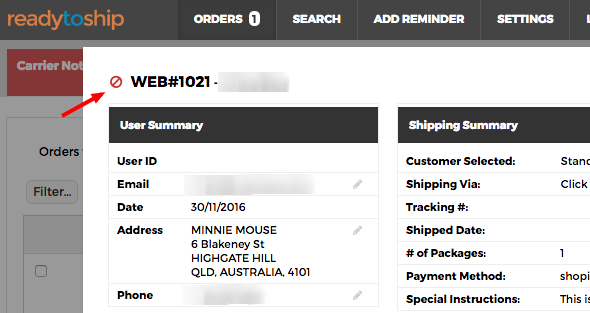 Sometimes you may need to manually mark an order as shipped, cancelled or modified in your eCommerce store. If you don't want to ship it using ReadyToShip, you can remove orders that turn red (click here to see how), or delete the order from ReadyToShip - see further instructions below. To delete an order from ReadyToShip permanently, expand the order then click the red cancel icon to the left of the order number. This will remove the order from ReadyToShip. If the order is activated again in your store it will not reappear in ReadyToShip.